Whether you are an engineer or a hobbyist who enjoys playing around with electronics, a digital oscilloscope is one of the must-have tools that will help you identify and solve puzzles quickly. The multi-purpose device allows you to measure the performance and efficiency of an electrical signal generator. The unit monitors the variation of signal voltages over time and displays the results in a two-dimensional plot for easy analysis of properties such as frequency, amplitude, time interval, rise time, and others. Unlike the analog oscilloscopes that display waveforms in their original form, the upgraded versions present waveforms in a digital format, eliminating the need for performing calculations. Now, if you need to get accurate results, you should consider buying the right digital oscilloscope. Unfortunately, telling the ideal option remains daunting since it’s more of a technical purchase. However, after dedicating good time to rigorous research, testing, and expert consultation, we have combined the top performing models for a more straightforward selection. 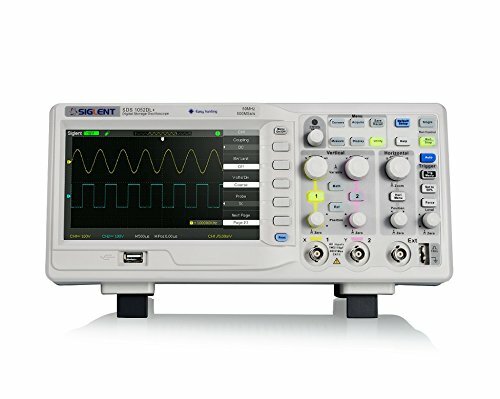 This high-quality oscilloscope provides excellent signal fidelity and performance. Furthermore, the system noise in this model is lower as compared to other systems of the same class. The history functions make playing back the latest triggers a possibility while the bandwidth of 200MHz guarantees reliability. For more accuracy, you need to consider buying a digital oscilloscope with a high capture rate. Siglet scope comes with a capture rate of 400, 000 wfm/s. This high rate means that the unit can accurately capture the hard-to-capture events you are unlikely to achieve when using other oscilloscopes of the same caliber. The state-of-the-art digital design of this unit is specially designed to perform measurements quickly without compromising on accuracy. Furthermore, this design means that the scope will not slow down acquisitions when conducting analyses. 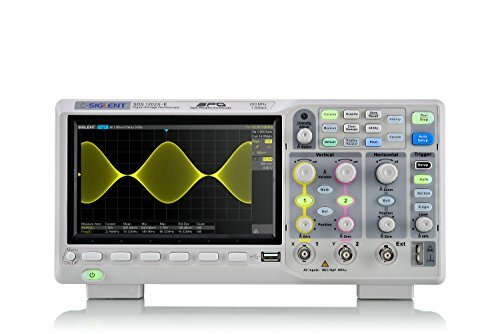 Siglet SDS1104X-E 100 Mhz Digital Oscilloscope has 16 digital channels which allow you to acquire and measure different signals simultaneously without the need for another digital device. This function grants you unprecedented flexibility in monitoring the performance of a circuit. One of the fantastic features of this digital unit is that it can allow you to playback the latest waveforms. This feature allows for an extended recording and analysis of a waveform. The screen of this scope is big. It comes with a built-in web server. The cables are slim and nice. The 1X/10X switch is easy to shift accidentally. If you are a hobbyist who is operating under a tight budget, this digital scope would be a good option for you. The premium-quality unit packs lots of fantastic features you will only find in the expensive models. For example, it comes with great construction to guarantee durability while the Ultravision technology grants the unit a deeper memory waveform. Rigol DS1054Z Digital scope features four channels. This feature allows you to measure different waveforms simultaneously using a single gadget. The oversized 7-inch display and 800 x 480 display to let you view all the channels on the same screen. The signal intensity setting of the screen helps meet your display needs. 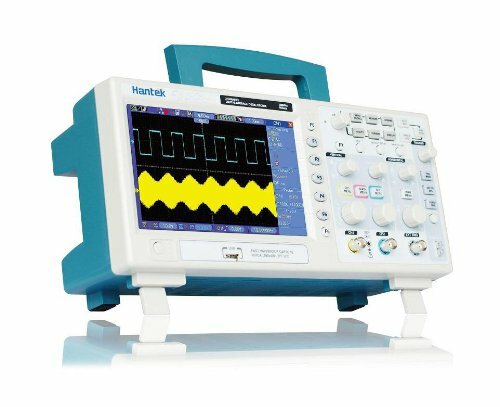 The bandwidth measures the range of frequencies that an oscilloscope can reliably measure. It defines the ability of a unit to detect a signal change. Therefore, the higher the bandwidth, the higher the chances of the scope noticing a signal change. 50Mhz isn’t a bad rate for such a budget-friendly option. A scope with many channels delivers a low sampling rate when all the channels are turned on. With this in mind, this oscilloscope comes with a high sampling rate of 1000 Mega samples per second. Therefore, when all the channels are turned on, each channel delivers a sampling rate of 250 mega samples per second. This rate is also a bargain for such an option. Updating to the latest software is easy. It may absorb very weak signals. This unit comes with 1 Giga sample rate per second that ensures that the LCD captures even the rare events. The noise of the scope is also lower than those of other gadgets of the same class. This feature delivers accuracy since it lets the unit to capture even the weakest signals. This digital scope features a 14mpts memory depth. The large memory allows you to capture more signals when using a higher sampling rate. This feature means that you have a higher chance of finding a bad waveform. This modern design delivers higher refresh rates as compared to those of the conventional oscilloscopes. In other words, this technology provides improved performance to the scope and guarantees the user with an excellent signal fidelity. Unlike the intensity-graded intense function that uses different color intensities (of the same color) to show events that occur more and less frequently. This scope utilizes the color-temperature display that uses different colors to show the trace occurrence. In this model, the red color denotes events that occur more frequent while the blue color indicates the events that occur rarely. The real-time sampling rate is high. It has a pretty large memory depth. You may need to change the sweep delay time whenever you want to set the trigger position. If it is your first time to use a scope, this would be a good option since it comes with an intuitive user interface. The unit comes with 2-channel functionality which makes it perfect for use in engineering and experimental projects. The unit delivers a maximum sample rate of 10 Ms/s and a memory depth of 8K. One of the features that will draw you near to this scope is the beauty. The o-scope features a durable shell housing with an aluminum finish. The beautiful finish not only steps up the aesthetics of the oscilloscope but also extends the service life so that you get the maximum value for your money. If you find yourself traveling more often, this would be a good option for you. The compact design of the digital oscilloscope means that it conveniently nests in nearly any pocket so that you can always have it available whenever you want it no matter where you are. Never used a digital oscilloscope before? No problem! This unit comes with an easy-to-use design since it uses taps and swipes just like a smartphone to make the operation more straightforward for almost anyone. Another fantastic feature about this portable option is that it allows you to save waveform images effortlessly in the 8MB flash storage. This feature means that you can also transfer the saved waveform images easier than ever before! It has a solid feel. It has a good contrast screen. It doesn’t come with the perfect probe. This digital gadget comes with two-channel functionality which makes it a must-have in any electronics kits. Each of the channels has a maximum sampling rate of 500MS/s to ensure preciseness in measuring waveforms. A higher resolution display is also one of the things you will probably admire about this premium-quality scope. 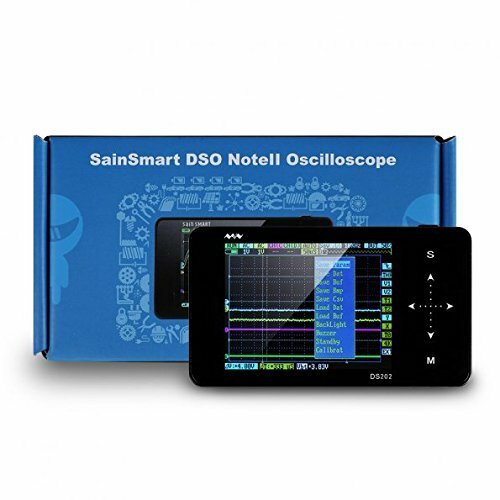 Whether you want it for electronic circuit debugging, circuit function test, product quality control, learning purposes, inspecting instantaneous signal, or industrial control, this o-scope is engineered to provide accurate results no matter the application. This premium-quality scope comes as an upgraded version of the older SDS1052DL model. The later design comes with a higher-resolution LCD and an improved user interface. These improvements help to optimize user experience. Furthermore, saving a screenshot is also a snap- just insert a thump drive and press the print button. Siglet SDS1052 Upgraded model also features improved triggers. The enhanced functionality allows the device to isolate different signals easily while the high bandwidth maximizes the probability of the oscilloscope to notice a change in signal. It comes with color-coded probes. The lightweight design makes it portable. The fan is quite noisy. 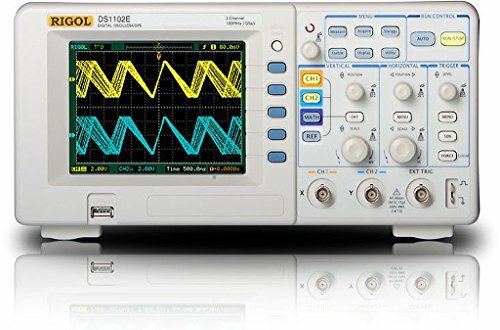 If you have been using an analog oscilloscope before, you should consider switching to this unit. The scope comes with a good construction for beauty and lots of features than what most hobbyists will ever use. The intuitive user interface means that it will deliver accurate results whether in the hands of a starter or a pro. The screen of this scope is bright and clear enough so that you don’t get a hard time to read the display. Furthermore, the multi-tester unit is specially designed to deliver accurate measurements of waveform properties such as voltage, mean, frequency, and maximum and minimum volts. The intuitive graphic user interface means that this is one of the easy-to-use models. However, just in case you are finding it challenging to use, the device comes with comprehensible instructions that provide a step by step guide to ensure that you do not rely on guesswork. The 1000 Mega Samples per second (MS/s) of this scope ensures maximum accuracy in measuring wavelengths. Since it is a 2-channel scope, each channel has a sample rate of 500 MS/s which is a pretty higher update rate for capturing events. It comes with many trigger modes. It features a large LCD. It is a portable scope. The unit may produce some system noise. This high-quality oscilloscope comes with a multi-language interface for use by different users. The scope supports both Chinese and English input and features a replay functionality that allows for playback of latest waveforms. One of the amazing features about this unit is that it comes with a pop-up menu. The pop-up menu makes the unit super-easy to use hence perfect for those that have only used the analog versions before. This feature also makes it easy to read the display. This scope comes with a lightweight design that makes it among the most portable units in the market. The fact that it can be easily moved will allow you to use it in more projects than most other scopes could. If you are looking for a model that will give you service for years to come, this would be a good option. The premium-grade o-scope comes with rugged construction which makes it among the most durable digital oscilloscopes the market currently holds. It has a significant sample rate. The unit is super-easy to use. The quality of the unit is excellent. The unit is quite noisy for such modern equipment. The structure of this unit makes it also a good option for beginners. The oscilloscope comes with a straightforward design for easy assembly. Furthermore, although simple, it packs exceptional features for optimized user experience. For example, it comes with a large LCD that shows clear resultant information with perfect clarity. 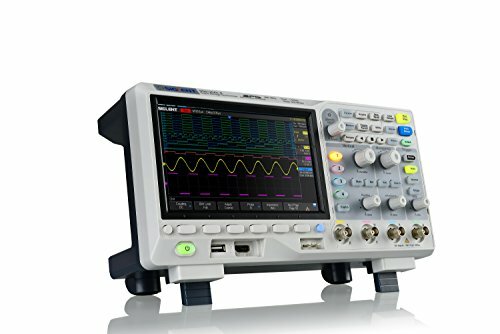 This is one of the unique features that most hobbyists love about this oscilloscope. The partially open-sourced design allows the users to customize the unit since it enables users to add new features or develop new applications on the software. As the name suggests, this is a Do-It-Yourself (DIY) kit. Therefore, since it requires your assembly, the scope features a simple design for a more straightforward combination of parts. To make the work even more comfortable for you, this oscilloscope comes accompanied by an understandable manual. Troubleshooting guide also forms part of the documentation. This unit comes in two configurations; the first configuration is the 13803K which replaces the 13801K while the other configuration is the 13804K which comes as a replacement for the 13802K. In both the configurations, there is no need for programming the MCU since it comes already programmed. It comes with a simple design. It is a good option for a learner. Customizing the settings is slow using the menu. 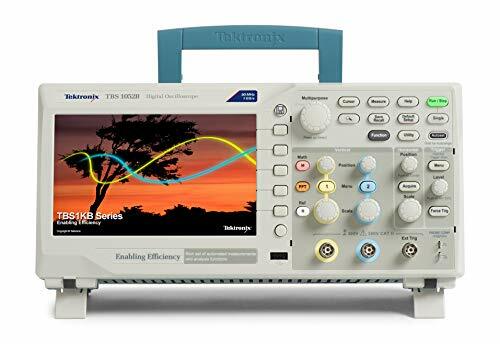 If you are in the lookout for a powerful yet ultra-quiet scope, choosing Tektronix TBS1052B Digital Scope would be a good way for you to go. This device does not come with a cooling fan to ensure a quiet and peaceful operation. TBS1052B Option also comes with a user-friendly interface. The intuitive graphic user interface allows the user to perform scope functions more quickly. The o-scope comes with a 7″ LCD. This large display allows you to view the signals and other information with more clarity. The Pam& Zoom feature lets you see signals with enriched details of up to 10 times the standard resolution. After the unit captures different signals, it evaluates the signals using the advanced math and measurement capabilities allowing the user to find the sum, subtract, and multiply the different waveforms. The feature also makes calculating different waveform characteristic such as means, frequencies, and overshoot a snap! This property is one of the unique features you get in this oscilloscope. When this function is activated, it is used to compare different waveforms against the predefined boundaries to determine whether it falls in the Pass or Fail category. In case a waveform fails the evaluation, the unit may respond by halting the limit test function, stopping signal acquisition, or saving a snapshot of the failed waveform. TBS1052B comes with a bandwidth of up to 200MHz and a sampling rate of 2 Giga samples per second. These features together with the vertical accuracy of 3% allow you to view accurate signal details. Furthermore, when adjusting the horizontal setups or using multiple channels, the sampling performance does not go down so that you see the actual properties of the waveforms. This oscilloscope has a larger display. It comes with a portable design. The triggers may be unreliable. This high-quality oscilloscope comes with a 3.5″ LCD that gives high wavelength visibility. The scope features a real-time sample rate of 100MS/s with a record length of 6000 points to guarantee individual waveforms. The scope is designed to present displays both on digital and analog formats. If you are looking for a scope that you can easily carry it almost anywhere, this will be a good option for you since it comes with a compact size. The compact size pairs with the lightweight property making it a portable oscilloscope. This device allows you to examine up to 18 different waveform characteristics automatically. The waveform properties include; mean, frequency, peak-to-peak, period, and many others. This feature allows the user to perform an in-depth analysis of the waveforms. Although this model is easy to use, this pack comes with easy-to-read instructions that provide the user with steps on how to perform operations using this scope so that you get the best value out of the scope just like the manufacturer intended. The screen of the device is anti-glare. The screen is pretty small. When choosing a digital oscilloscope, experts recommend that you select the one with at least five times higher bandwidth than the maximum frequency of the signal you intend to measure. The sampling rate is expressed in mega samples per second (MS/s) or Giga samples per second (GS/s). Sampling rate indicates the number of times per second a signal is read. Since digital oscilloscopes spend time in calculating it may not capture each signal. Therefore, it is essential you consider choosing the one with a high update rate to maximize the number of captures it makes in a second. After capturing sample points, digital oscilloscope stores them in a memory. The memory depth defines the amount of time it can save signals before becoming full. Therefore, it is essential to choose a device with a larger memory depth. Choosing a digital oscilloscope with more channels grants you more flexibility in viewing and debugging circuitry. This is because the higher the number of channels, the higher the number of signals can read simultaneously since each signal is fed to a different channel. However, the more channels you want to enjoy, the higher the oscilloscope is likely to cost. 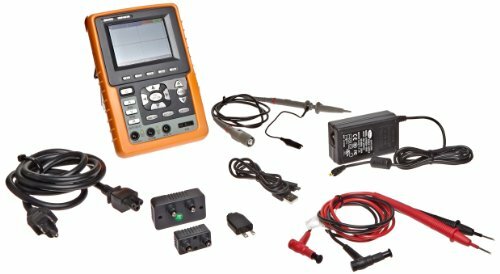 What is a trigger on Digital Oscilloscope? This is a point in which the waveform transitions to a predetermined voltage. This is also called as the trigger level. Why would you need an oscilloscope? 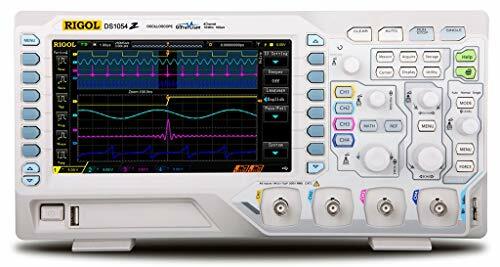 Oscilloscope monitor signal voltages and helps calculate waveform characteristics such as means, peak-to-peak, frequencies and many other waveform properties for the sake of analysis. 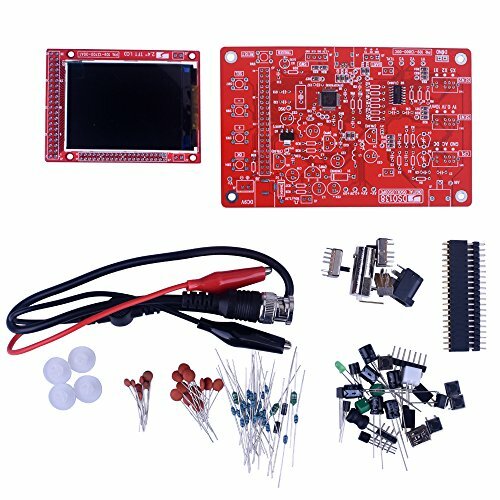 How do you set up an oscilloscope? The setup procedure may differ with the manufacturer. However, most of the oscilloscopes come with detailed instructions on how to set them up. Generally, working with digital oscilloscopes is more advantageous than the analog scopes. Before you select the right digital scope for you, it’s essential to ensure that it possesses all your target features. Although most of the top-rated models above come with great features, I personally rank Tektronix TBS1052B Digital Storage Oscilloscope above all other models since it comes with plenty of smart features.